In the 1990s, our R&B teenage darlings were Brandy, Monica and Aaliyah. There's something to say about these ladies (yes, even Aaliyah's legacy) surviving the test of time and still being cherished and relevant today. Monica's feature story in the latest issue of Uptown magazine sheds light on her career and how much she's grown as a person and as a woman. 1. Remember, Monica got a tattoo on her arm back during a time when it wasn't kosher for R&B darlings to be seen as "street," but she explained how that part of her persona was always there, and became more prominent as a result of a fracture in her parents' home. "People wouldn't really be able to imagine the things I've seen and been through." … "My talent has always been there, along with the spiritual foundation my mother laid, but there was always another side, a side that belonged to the streets. When my parents divorced, I became two different people." 2. High-couture fashion seems to be the norm for today's young starlets, but unbeknownst to many, Monica had Chanel's creative director drooling over the chance to dress her. "I've been there and done that." … "I remember speaking with Karl [Lagerfeld] and him telling me what 'we' were going to wear, and what his thoughts for me were. I've had moments that some [will not recognize] because social media wasn't a thing back then. They weren’t done for the 'Gram, but that doesn't mean they didn’t happen." 3. She's explained this one time and time again: Her no-holds-barred attitude wasn't an affectation she developed as a result of being in the music industry but, rather, something she brought to the studio even as an adolescent recording her debut album. "[Her producer] Dallas [Austin] would bring producers in the studio to play records for me and I’d be quick to say 'No' if I didn’t feel it. I knew who I was and what I wanted to say." … "That’s where 'Miss Thang' came from. He'd say, 'Miss Thang don’t like it!' "
4. Monica is perceived as royalty by urban America, but there's the idea that she's never crossed over heavily into the mainstream. That's something that sits fine with her. 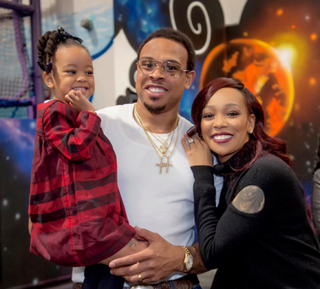 Monica, who married the NBA's Shannon Brown in 2010, doesn't regret taking time off to raise her children and allowing love to be the foundation from which all other things come to fruition. "I know people have called me the underdog." … "I was even told the kiss of death would be the four years I took off after the birth of my boys. I've executed my career exactly how I've wanted to and that's the most important thing. And if I am an underdog because I've chosen to put my family first, to be guided by my spirituality or allow true love to be my solace, then so be it."